BadukTV has hired Shawn Ray 4d, better known as Clossius to his YouTube and KGS fans, to do a series of lessons in English for the network. “Thanks to the success of my YouTube channeI, I was offered a job at BadukTV – on the condition that I relocate to Korea,” Ray told the E-Journal. 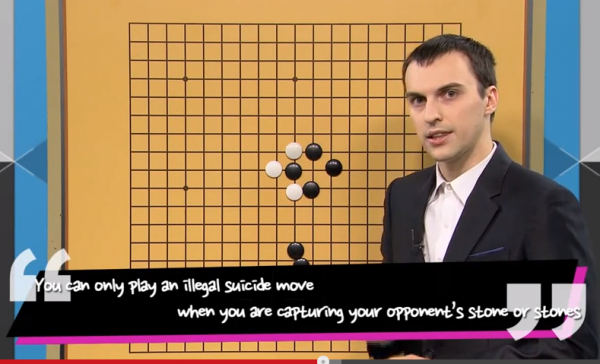 “I took this opportunity to move to Seoul and study baduk (go in Korean) seriously. I am planning to stay until I become 9D and then I want to come back to America to become a Pro player in the AGA.” Ray’s first video for BadukTV, which includes a fun animated opening, is available here. “Our self-study consists of reviewing at least 4 pro games a day, doing at least 1 hour, or more, of life and death problems. Problems at your level can take anywhere from 1-5 min. Usually we go through nearly 100 problems per week. We also study Baduk books and analyze positions and new openings or joseki. It is a very intensive schedule to maintain and can mentally exhaust you very quickly. It took me a whole week before I was fully able to deal with the training regimen,” said Ray. “My dream is to become a Pro player and start a go school in the U.S. and find a way to make a living teaching go. It is my hope that I can help raise the level in the U.S. so that one day we can compete internationally with the top Asian players. I have to thank all my friends and followers for their support, otherwise I would have never made it this far. In addition I would like to thank Jennie Shen 2P, who has been my teacher ever since I started playing go. Lastly, the inspiration to think I can still become pro is due to Andy Liu 1P, who is around the same age as me, yet is one of the top players in our country. It is my hope to rise to his level, and he showed me it was possible even at my age,” said Ray. Interested readers can join Clossius’s Go Group on Facebook, where he will be posting about his adventures, and even offering discounts on go books. -Paul Barchilon, E-J Youth Editor. Image courtesy of BadukTV.